Finally I decided to make a post completely dedicated to Morocco Stamps..It only have stamps from the French Period.. I think I will need one more post to end this period.. I will make a Chronological approach , with stamps starting in 1914.. 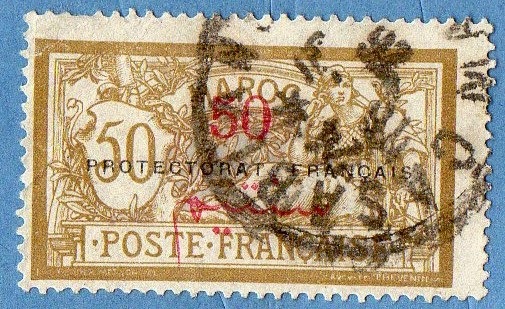 This is a stamp originated in France in 1900 and presented in Morocco in the Surcharged form , for the first time in 1903 (with the label 'Maroc' and surcharge in 'Centimos' / Spanish Currency)..In 1911 it was surcharged in French Currency and Arabic Label and in 1914 was Overprinted with ' Protectorate Française' .. The stamp is commonly known as 'Type Merson' in homage to it's Designer Luc-Olivier Merson..
Two beautiful stamps from the first of the many series from this period , dedicated to Morocco Monuments and Landscapes.. 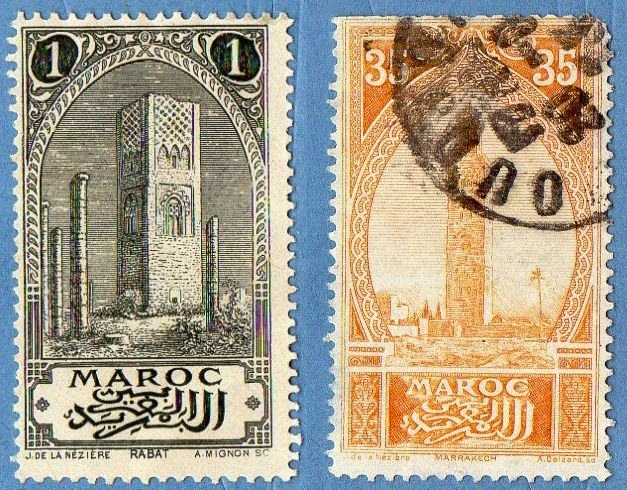 The 1st stamp represents the Tower of Hassan, Rabat and the 2nd the Koutoubiah, Marrakesh. 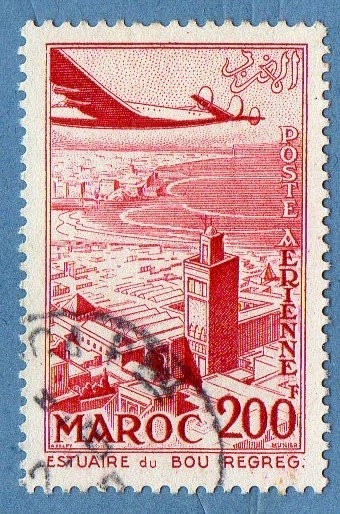 This is a 1933 Air Mail Series representing an Air view of Rabat and the Tower of Hassan. From the more conservative style of Joseph De La Neziere , we are now entering the days of the more Modern vision of Camile Paul Josso . He was the Designer of the 1st and 2nd stamps, and was of great importance from now on , in the Morroco Philately.. The first two stamps highlight the importance of the Cedar in Morocco's Landscapes..the 3rd show us a View from Fez and the 4th represents a Mosque in Sale..
Once again we have small format stamps.. the 4 first stamps belong to a series and the 5th to other one.. The 2nd stamp present us two varieties, differing one to another by the letters used to assemble the label 'Maroc' .. in this case we have a 'Type 2' stamp.. This last stamp show us an Air View over Rabat and the Hassan Tower..
You've shared a stamp collection that's really wonderful. And I really like this collection.